Toothbrushes are one of the most valuable tools in your bathroom. What other item is such a vital instrument in maintaining not only your oral health but also your smile? In today’s rushed lifestyle electronic toothbrushes have gained popularity for their ease of use, and the great results they deliver by keeping plague at bay. Our Electric Toothbrush Reviews cover all the best models in depth, along with a brief summary for the readers who don’t want to spend a lot of time reading the analysis. Our reviews cover the important details of electric toothbrushes, such as battery life, recharging capabilities, ease of use and most importantly the price. As manufacturers release new models or upgrade their current Electric Toothbrushes, we update our guide, so it always reflects the latest models. For our readers who want to get straight to the action, and work out which electric toothbrush to buy, use our ‘best’ index below to work out the leading toothbrush model for each price quickly, and our selection as the best electric toothbrush in 2017. We are always looking to improve our blog, if you have any comments or suggestions, please use the post comment area at the bottom of the page or the site contact form. Our pick for the both the top electronic toothbrush in 2017 and number one sonic toothbrush is the Philips Sonicare HX9332/05 DiamondClean toothbrush. While it’s not cheap at a price of approximately $190, but any owner will tell you it’s an amazing brush. Designed with five different power modes, USB charging to make travel brushing a breeze, 3-week battery life and patented diamond brush brilliant for cleaning plaque in between your teeth. The ceramic-like power handle, which I thought might get slippery during usage when wet, actually maintains an excellent grip to it. No vent holes in the travel case made worse by its form-fitting plastic interior. So if you pack the brush head while damp, which often happens when moving, it stays moist, in a dark, tightly enclosed space, the perfect conditions for promoting bacteria and mold. From the hundreds of Oral-B toothbrush models on the market, I’ve picked the Oral-B Deep Sweep 1000 as the best Oral-B unit. This may surprise some people seeing it costs around $40, but if you’re looking for a solid brush without the bells and whistles, then look no further. 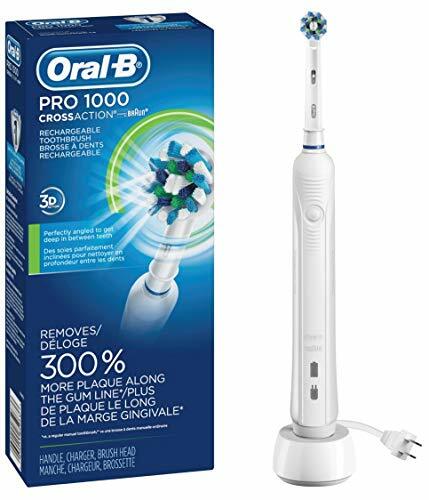 I previously owned a top-of-the-line Oral-B Professional 5000 toothbrush, so I was pleasantly surprised how close the cheaper version comes to it. Overall, I’d say it comes very close and is a worthy option if you don’t want to break the bank. Oral-B 1000 version doesn’t brush as quickly as the higher-end models. Performs 20,000 pulsations per min, while the most expensive models perform 40,000 pulsations per min. So theoretically the quality of cleaning is not as great, although most owners wouldn’t notice the difference. There is no external timer, so you cannot see exactly how long you brushed for. I don’t consider this a major deal, though, because the brush vibrates every 30 seconds (so you know it’s time to switch positions). Philips and Braun currently dominate the toothbrush market. It’s no wonder considering the high quality of their Sonicare and Oral-B products. For anyone who hasn’t bought an electronic toothbrush before, Sonicare and Oral B are the first models to consider. While this page includes a meaningful comparison of Sonicare Vs Oral B, you should know that finding the brush that suits you best will depend on your lifestyle. Our comparison table of the Sonicare vs. Oral-B products highlight the benefits of each model as well as an approximate price. If you’d like to be able to view the exact products specification, click the ‘more info’ link and compare hundreds of reviews, and quickly find the brush that fits you best! Each of the 7 of selected electric toothbrushes that we’ve mentioned all have these characteristics so would make a good choice for people wearing braces. Rotating-oscillating – Their head spins in circular, clock-like motion and does almost all the work. The technique used for brushing is moving the brush head slowly from one tooth to another while the rotating motion efficiently removes plaque from the teeth. Sonic – Sonic toothbrushes require a side-to-side cleaning motion to remove plaque effectively. Latest developments in these models are ultrasonic toothbrushes. Ultrasonic brushes vibrate at much faster frequencies and have been proven to remove plaque more efficiently. As a general rule of thumb, your brush will require a replacement brush head fitted every three months. Brush heads are a matter of personal preference of size, shape, and material. Recently some third-party manufacturers have popped up who make replacement heads for Oral-B toothbrushes that tend to be much cheaper. If you’re looking to upgrade your current model or simply grown tired of using a manual toothbrush, we hope our guide has helped you narrow your choice. The affordable toothbrushes make it easy to take great care of your teeth and avoid expensive tooth complications later on in life. You can pay more for additional features but remember according to dentists an entry-level brush will clean your teeth just as well as any of the many more expensive brushes. If you’re looking to upgrade your current model or simply grown tired of using a manual toothbrush, we hope our guide has helped you narrow your choice. The affordable toothbrushes make it easy to take great care of your teeth and avoid expensive tooth complications later on in life.